You are here: Home / LifeTopix / Common Questions / Q. How Do I Track My Education and Learning Efforts? The Education topic is perfect for managing all learning topics, assignments, education-related information resources, and class notes. You can set up all your subjects and add assignments to your subjects. Alerts and automatic reminders keep you on top of your studying, practice, and homework assignments through integration with your device’s calendar. 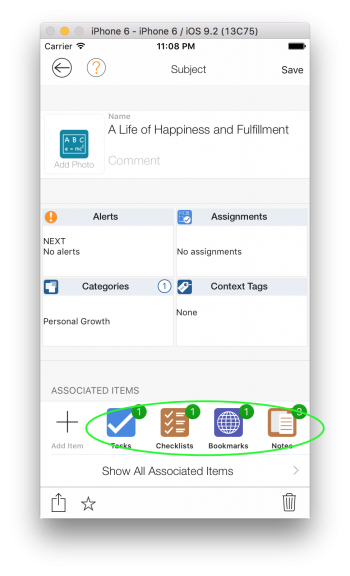 In addition, you can add various items to the Education topic, such as tasks, bookmarks, photos, tasks, and more. You can also add assignments (projects) using the assignments tile. 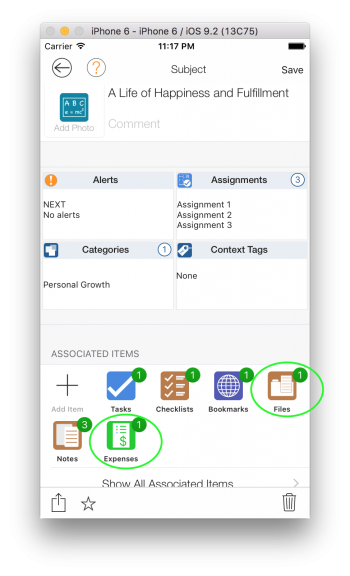 Each of the assignments is a project that has start/end dates, status and can have other associated items like Notes, Tasks, Photos, etc. The associated items section allows you to keep track of bookmarks for online references, such as syllabuses, schedules, invoices, files, and class assignments, as well as other reference materials and to-dos.